An Opportunity Missed is a letter written by Arthur Conan Doyle first published in The Times on 20 march 1916. Sir, — It is exasperating to see the Volunteers drilling assiduously night after night while the married Derby recruits take no pains to get on with their training. Had a connexion been formed between them when it was first suggested, these men would have already been well advanced in their education. 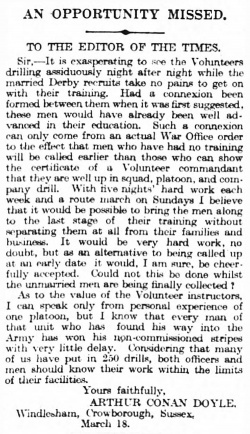 Such a connexion can only come from an actual War Office order to the effect that men who have had no training will be called earlier than those who can show the certificate of a Volunteer commandant that they are well up in squad, platoon, and company drill. With five nights hard work each week and a route march on Sunday. I believe that it would be possible to bring the men along to the last stage of their training without separating them at all from their families and business. It would be very hard work, no doubt, but as an alternative to being called up at an early date it would, I am sure, be cheerfully accepted. Could not this be done whilst the unmarried men are being finally collected ? As to the value of the Volunteer instructors, I can speak only from personal experience of one platoon, but I know that every man of that unit who has found his way into the Army has won his non-commissioned striped with very little delay. Considering that many of us have put in 250 drills, both officers and men should know their work within the limits of their facilities.